this a truly American bird. 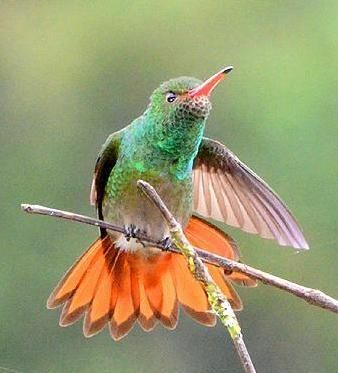 While most hummingbirds are found in Central and South America, some species of these tiny gems searching for food and shelter grace many a North American garden. If you are in an area where hummingbirds live or migrate through, you can make your yard or patio a haven for hummingbirds by doing just a few things.1 – Their tiny size and high energy rate cause them to eat about every 15-20 minutes. That means there needs to be fresh nectar readily available at all times. Having the right nectar-producing plants is the best choice, but while hummingbirds are attracted to red flowers, not every flower has the nectar they need. Find a list of hummingbird attracting plants in your area with the Audubon Native Plants Database. 2 – If you prefer to use a feeder, get the right recipe, clean it out regularly and NEVER use red dye or purchase any hummingbird food that has red dye in it as it can be toxic. For more information on hummingbird safety, check our our blog post. 3 – Fresh open water is essential for both drinking and bathing and you can provide a shallow bath and even a mister in warm weather which will please them no end! 4 – Nesting material is important in the season. Plants with seeds that have hairs that help them waft in the breeze, or that produce fluffy materials for nest building like cottonwood, lambs ear, milkweed, cattails or clematis are a good idea to be part of your garden so the birds can strip the fluff off to line their nests. 5 – A safe place to nest, hide during storms or to pass through is important when your weight is measured in grams. This means no insecticides, no red nectar, and no cats in the yard! For more information on how to plan your garden for hummingbirds, check out this article from Audubon.